Nearly everyone enjoys the plump crimson fruit of the tomato plant. But any number of bugs may plague your tomatoes, attacking both the fruit and the foliage. Spraying tomato plants with a chemical insecticide should be your last resort. With the right cultural practices and garden management, you can deter and repel bugs to protect your tomato harvest. Keep your tomato plants healthy. A healthy, vigorous tomato plant is less susceptible to insect pests. Provide the thirsty tomatoes with sufficient water (4 to 6 quarts per day), amend the soil with aged compost and standard garden fertilizer (apply according to the fertilizer's label, since potency varies by product) and harvest the tomato fruits as soon as they're ready to avoid attracting hungry bugs. Spray the tomato plant with a homemade insect repellent. Boil a couple of heads of garlic in a quart of water. Allow the water to cool, and pour it into a spray bottle. Add 2 tbsp. of liquid dish soap. Spray the solution on your tomato plants. The soapy spray suffocates and kills insects, while the strong-smelling soap residue repels both insect pests and wildlife pests like rabbits and deer, according to Care2.com. Plant insect-repelling herbs around your tomato plant. Cornell University recommends strong-smelling vegetation such as parsley, onions, dill and chives. For example, basil shrubs planted near your tomato plants help to drive away the tomato hornworm, a common tomato pest. Many of these herbs also attract beneficial insects that attack insect pests. Dust your tomato plants with food-grade diatomaceous earth. 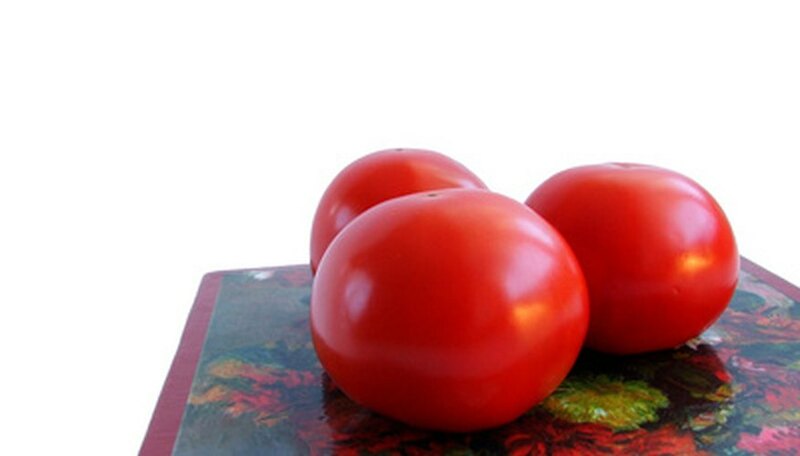 This all-natural powder doesn't harm your tomatoes but kills many types of bugs. When dusted onto the plant's foliage, the powder deters caterpillars and other insects that may otherwise be drawn to the leaves. Treat your tomato plants with a standard garden insecticide product like insecticidal soap formulated with neem oil. Such products can be obtained from all garden stores and nurseries and can defend your tomatoes should your deterrence efforts not be sufficient to ward off a bug invasion.